Playgrounds, despite providing wonderful opportunities for fun, exercise and recreation, can be a hazardous place when safety is ignored. Each year 250,000 children below 15 years in USA sustain injuries at playgrounds and require emergency treatment. 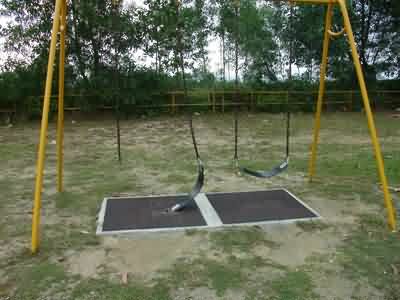 In Malaysia about 3000 cases of injuries occur at the playground every 3 months. The injuries commonly involved children between 5-9 years of age. Playground surface was the most frequently identified factor contributing to injuries (Ref. Epidemiology of Injuries in Malaysia). Children can fall off the equipment, fall from height or trip over equipment. Falls account for 75% of playground injuries. Blows or knocks from playground equipment or other children. Playground equipments commonly associated with injuries is swings, monkey bars, slides and seesaws. Children should always be supervised at play. There should be designated places for parents and care givers to sit. 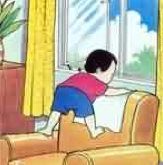 Look out for behaviors like fighting, pushing, shoving, crowding around equipments and playing outside designated areas. Ensure that children do not bring bicycles onto the playground as this can cause injuries. Ensure that children are properly attired when going to the playground so as to prevent tripping, clothes or hair getting caught in equipment. Ensure that the playground is in good condition, without jagged edges or sharp points. No worn out or missing parts. Materials like metal, plastic, wood are smooth and not deteriorated. Surfaces need to be maintained, be free from sharp edges. All equipment should be fixed securely to the ground. What are the safety features to look for in a children’s are playground? Parents should ensure that children play in playgrounds with good safety features. If the playgrounds near your homes are not safe for children, please inform your local authority. Equipments should not be higher than 8 feet and if they are, guardrails (about 38 inches high) should be present. 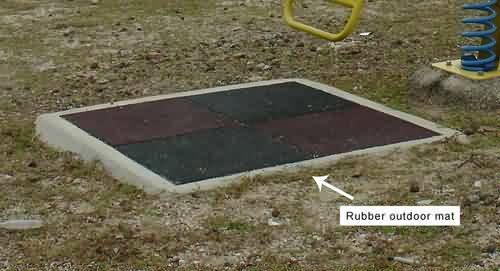 Rubber outdoor mat (see American Academy of Paediatrics Public Education Brochure). Spaces should be between 3.5 inches to 9 inches so that it is not possible for the head to get entrapped (SIRIM Safety Playground Standards). There is a risk of catching of children’s clothes from protruding nuts and bolts. They can also cause strangulation, punctures or serious wounds and eye injuries. There should be no exposed concrete footings, surface elevations, tree stumps and rocks which can cause tripping. 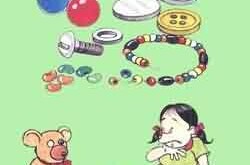 There should be separate playing equipment for pre-school and school going children.